For a long time there were rumors spreading around the information that Hyundai plans to introduce truck vehicle to the American market. Now finally we saw the promotion of the new crossover truck concept vehicle and to be honest we don’t know what to think.. This is the time when trucks are becoming popular again, and while the oil prices are the lowest in years, Americans are back in the truck game with mighty new Raptors, RAM Rebels and all kinds of different powerful models presented on 2015 NAIAS. In the middle of all this Hyundai decides to promote its mini-truck with crossover features and unibody structure. This promotion comes right after Honda Ridgeline discontinuation, and we all know how Subaru Baja ended up. The only real competitor in the lifestyle truck segment would be the Chevy Colorado, which is much bigger and bolder than the concept truck presented a week ago on 2015 North American international auto Show by Hyundai. When it comes to shape this is a compact unibody truck, I know you are now laughing your guts out, but that’s the only way to call it. This vehicle is aimed at women and people under 30 years old, which are the focus groups in which sales of pickup trucks in declining fast in United States. This vehicle is small, fuel efficient and it comes with the closed cargo compartment under the bed floor. Although some reviewers called this a Hyundai’s copy of Ridgeline, now after this vehicle’s debut we know for sure that this is not the case, since Santa Cruz is much more compact then Ridgeline and it bears more resemblance to the Hyundai crossover vehicles, with a chopped off rear hood part. It is also placed much lower than its other rival Chevy Colorado, which means it is not off-road oriented as much. It comes with overall tidy dimensions and a burly exterior look. It has hexagonal grille, nicely designed headlamps and fog lamps that are deeply sculpted. It also has blistered fenders and three hooks for securing bed and roof cargo. While some reviewers compared this truck to Subaru Baja we think that looks much more like the truck version of Subaru Outback released a while back called Subaru Brat. It comes with similar practicality, maneuverability and parking-space friendliness. It comes with a short truck bed, which cane be extended for additional five feet. Extension mechanism works on the drawer principle, and looks like one as well, where you simply drew out the tailgate, together with a bumper and taillights. Truck bed also comes with integrated hooks and built in cover which allows this truck to have a closed storage. This truck although small looking is an actual five seater, which makes it as functional when it comes to passenger transportation as a regular crossover vehicle. This truck comes with some big air vents which might lead people to thing that it has some real beastly engine under its hood. 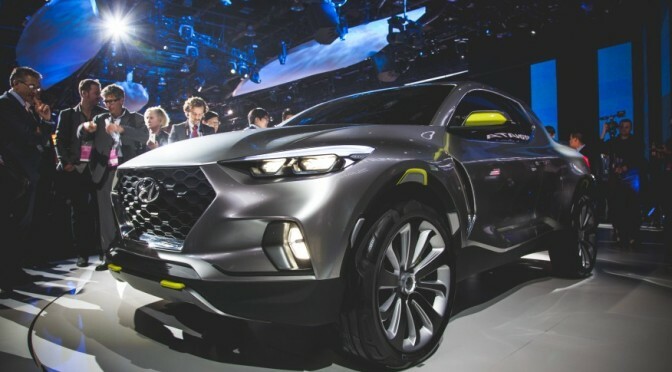 These are just for the show, because new concept comes with 2,0 liter diesel four cylinder engine, which is going to produce 190 horsepower and 300 pound feet of torque, with a promise from Hyundai that this vehicle is going to have more than 30 mpg of fuel economy in combined conditions. Hyundai might offer few more engine choices with the production version, for example the 2,4 liter four cylinder gasoline engine. Photo taken found on Car and Driver.